The day after President Trump’s first State of the Union address this year, my Global Cold War class had a discussion about his speech. My classmates spoke about their concern for President Trump’s immigration policies, and we moved throughout the class criticizing the various proposals mentioned in the speech. Although I disagreed with a lot of the president’s policy proposals, I mentioned that I supported his comments about lowering the prices of prescription drugs and criminal justice reform. My classmates seemed really surprised that I was willing to express my support for something that Trump said; I’m pretty outspoken about my dislike for the president and my liberal political opinions. My peers didn’t respond to Trump’s statements in the same way that I did. They mentioned the things that they disliked about his speech and his ideas. The fact that my peers only criticized Trump has made me realize that Horace Mann students often think that in order to be intellectual, we have to be critical. For the past four years of high school, assemblies have often been followed by discussions. In many of my classes, these discussions have started with students critiquing whatever guest speaker or student presented that day. One or two students will speak up in support of the presenter, but the majority of the conversation focuses on criticism. For example, when Margaret Hoover spoke to our school, my classmates (from all sides of the political spectrum) criticized her, some based on her being too conservative and others on her not being conservative enough. Very few of my peers spoke positively about her presentation to the school. When my classmates are criticizing someone in this way, I think it affects my own reaction and opinion regarding the presenter. If my peers are criticizing someone, I think I am more likely to then look for other aspects that I can criticize as well, even subconsciously. Of course, I think it is important for all students to speak up in class with different opinions and ideas, but that’s a lot harder when you’re the one with the contradictory opinion. It becomes easier to just add another criticism than to support or compliment something. I’m not sure what compels Horace Mann students to start out being critical of someone. 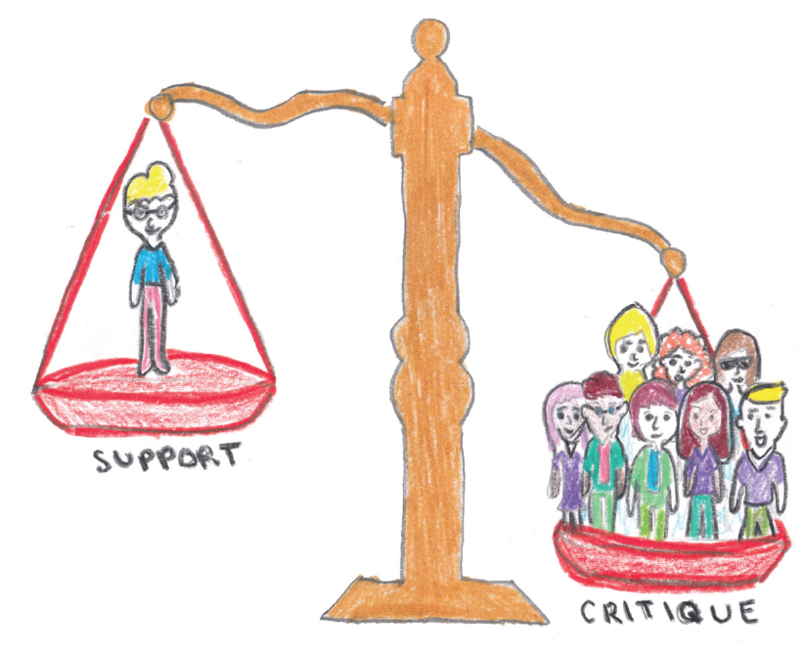 I am sure that there are times when students are speaking in support of someone or an idea, and someone in the classroom doesn’t speak up to criticize them because they feel outnumbered, but in my experience the conversation tends to lean toward criticism. I don’t mean to say that we should always agree with speakers and presenters, nor should we keep our opinions to ourselves when we do agree, but why, in order to be seen as intellectuals, do we feel the need to criticize? I have certainly felt that a comment I make in support of an assembly or presentation was not worth as much in the classroom conversation as a comment criticizing something about the assembly. I have also noticed this with opinion pieces in the Record and how we discuss them in my classes. We have more discussions about op-eds when we disagree with the ideas of the writer, than we do when we agree with and support what they have to say. I think it is important to consider articles and people and share why we agree with their ideas as well, and to not only to speak up when we have a criticism to make. There is no “easy fix” to change the course of discussions in all of our classrooms. One way that we could try to open up the conversation for criticism and support is if there is an opportunity to speak on both issues. One of my teachers, whenever they were opening up the classroom for a conversation about an assembly or current events topic, would start by asking for people to speak up who wanted to support the subject. Once a few people had spoken, they would ask for people to speak up who wanted to criticize the subject, and the conversation would continue after a few people had spoken on both sides of the issue. I think that this model really worked to facilitate classroom conversations because it allowed for a variety of opinions to start off the conversation. No solution is perfect, but it would be a step in the right direction to allow for a variety of opinions at the beginning of a conversation without singling a student out or having them feel that they can’t speak in support because the majority of the class has already criticized the subject.